KANT is a software package for mathematicians interested in algebraic number theory. For those KANT is a tool for sophisticated computations in number fields, in global function fields, and in local fields. 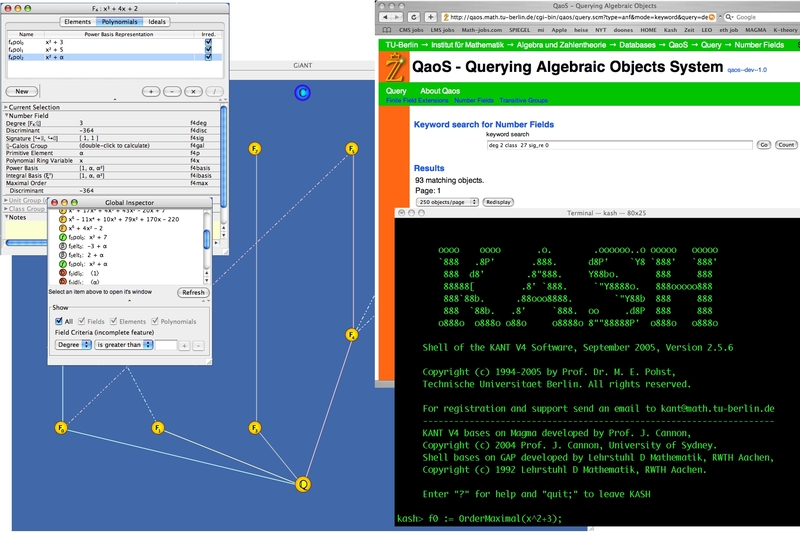 Many parts of KASH have been redesigned since the release of KASH 2.5. We must apologize to our old KASH users that code written for KASH 2.x will not run under KASH3 without modifications. There still will be bug fixes and at least one more version of KASH 2.x. KASH is freely available. You can pick up the current release of KASH using ftp. You can download the documentation for KASH separately. Most of the functionality of KASH is also available through the web interface webkash. Many of the algorithms, which are implemented in KASH/KANT, are described in the publications of the KANT Group. Take a look at a KASH sample-session (taken from the ICM 98 Mathematical Software Session). Please mail all your questions, suggestions, comments and bug reports concerning KASH to kant@math.tu-berlin.de.